Figure 1 shows a maximum likelihood cladogram (-ln likelihood = 211,110.54) for the 16.4 kb data set under the GTR + r + I model of sequence evolution. Figure 1. Maximum likelihood cladogram, with bootstrap values shown below branches, for the 16.4 kb data set. 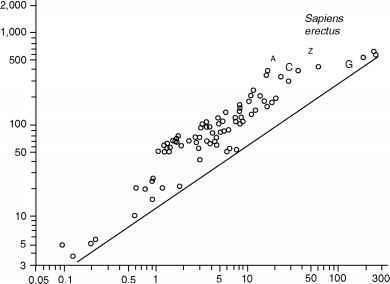 Asterisks indicate clades that were constrained in maximum likelihood analyses. The range of Bayesian posterior probabilities from four independent MCMCMC runs with the 16.4 kb data set is given above each branch (also see Tables 1-4). In cases where only a single value is shown, this value was obtained in all four runs. Abbreviations: s.e.=short-eared; i. e=long-eared. Bootstrap support percentages are shown below each branch. Four independent Bayesian (MCMCMC) analyses, two that were run for 600,000 generations and two for 300,000 generations, resulted in the same topology. The range of posterior probabilities (all four runs) is shown above each branch, with posterior probabilities expressed as percentages. Tables 1-4 show posterior probabilities for individual MCMCMC runs. Although the maximum likelihood tree and Bayesian trees (from independent runs) were topologically identical, bootstrap proportions were generally lower than posterior probabilities. Consistent with the maximum likelihood analyses presented in Madsen et al. (2001) and Murphy et al. (2001a), our analyses recovered four major clades of placental mammals: Xenarthra (Cingulata, Pilosa); Afrotheria (Afrosoricida, Macroscelidea, Tubulidentata, Hyracoidea, Proboscidea, Sirenia); Euarchontoglires (Rodentia, Lagomorpha, Scandentia, Der-moptera, Primates); and Laurasiatheria (Eulipotyphla, Chiroptera, Carnivora, Pholidota, Perissodactyla, Cetartiodactyla). There is also moderate to strong support for relationships between these groups. Euarchontoglires and Laurasiatheria are sister-taxa that together constitute a clade named Boreoeutheria (Springer and de Jong, 2001). The basal split among living placental mammals is between Afrotheria and Boreoeutheria + Xenarthra (herein named Notolegia, see below for definition). Bootstrap support for Notolegia was 76% and posterior probabilities were 0.99-1.00 in independent MCMCMC analyses with the complete data set. Two competing hypotheses for the position of the root that had the next highest likelihood scores are: (i) at the base of Xenarthra (i.e., a basal split between Xenarthra and Epitheria; -ln likelihood = 211,119.66) and (ii) between Atlantogenata (i.e., Afrotheria + Xenarthra) and Boreoeutheria (-ln likelihood = 211,115.95). SOWH (Swofford-Olsen-Waddell-Hillis) tests (Swofford et al., 1996; Goldman et al., 2000) rejected these locations for the root (Murphy et al., 2001b). There were no other positions for the root that had nonzero bootstrap percentages or nonzero probabilities in likelihood, and Bayesian analyses, respectively. *With the exception of the maximum likelihood bootstrap analysis that was run for the full data set, all other analyses reported in this table are MCMCMC runs with MrBayes 2.01 (Huelsenbeck and Ronquist, 2001). All Bayesian analyses with outgroup jackknifing and subsets of genes were run for 300,000 generations, with burnins set at 60,000 or 75,000 generations based on empirical evaluation. NA, not applicable because clade was constrained in ML bootstrap analysis. below). Within Variamana, the next split is between Chiroptera and Fereuungulata (carnivores, pholidotans, perissodactyls, cetartiodactyls). There is strong support for a carnivore-pholidotan clade within Fereuungulata. Euarchontoglires is divided into Glires (Lagomorpha + Rodentia) and Euarchonta (Dermoptera + Primates + Scandentia), both of which receive high bootstrap support percentages and posterior probabilities. Within Euarchonta, Scandentia and Dermoptera are sister-taxa (bootstrap support = 85%; posterior probabilities = 1.00 in four independent MCMCMC runs).